In this cafe, Computation and Creativity, Prof. Greenberg showed the teen participants his computer program designed for creating art on the computer. He showed us some basic functions on the program and then gave a computer for every 3-4 teens and let them follow along. He would be showing something on the projector and the groups of teens would be making that same shape on their computers. In addition to this interactive piece, he showed us some of the work that his students have done with the program. That work was truly astonishing. For example, one student was very interested in the topic of banned books so she created a program where there would be a sea of bubbles on the screen and if you clicked on the bubble it would tell you about a banned book. The bigger the bubble on the screen indicated the more states that banned. The participants loved the interactive component of this cafe as well as the interesting and different content that the speaker had to offer. 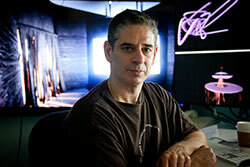 To me, the biggest thing that Prof. Greenberg got across was that science and computers can be used for many purposes, like even art and creativity. Prof. Greenberg’s presentation got rid of the stereotype that computer science can only be used for “boring” purposes and never for anything fun. Based on the participants’ reaction to the presentation, I think that they now understand that computer science can be used for any purpose, and can even be fun! The hands on activity consisted of groups of teens working with Prof. Greenberg’s program. He would teach us how to make a certian shape, color, etc and the groups would try that on their own. The hands on component was great and it kept the participants’ very engaged and excited about the topic for the full two hours. Also, I felt that this hands on activity helped the participants talk more with each other and made the cafe as a whole more social.